An exhibition of previously unseen photographs selected from Sir Michael Savory's archive at Muckleburgh. An installation of 8 new lightboxes created by Anna-Lise Horsley in Cromer Parish Church. This piece will stand as a small rememberance of what is destroyed in war. 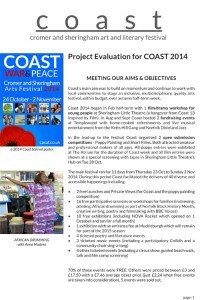 We were thrilled to welcome back BBC Voices to COAST 2014 to run FILM PRODUCTION WORKSHOPS on Thursday 30 October. BBC Voices is a media workshop and production unit for film, music and radio based at The Forum in Norwich. 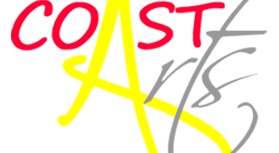 The team provides film making and radio editing workshops and sessions to individuals, groups, businesses, schools and colleges throughout the Eastern region. An afternoon of tea and music with The Honeybirds, close harmony singers with a vintage style. An assemblage of the unexpected, found objects, images and daily occurrences. Following on from it’s sell-out success last year, and based on the international touring Covert Club, this year’s cabaret will whisk you back to a 1960’s underground Soho club. "We think the rules are there to be broken" Painter and Photographer Samuel Thomas and David Morris cross a few boundaries in their different interpretations of Norfolk and beyond.